We come highly recommended by our clients throughout all Brisbane Northside suburbs for the superb results and friendly, professional domestic carpet-cleaning services we provide. It starts with the respect we have for the home of each customer we serve. We will treat your carpet with care and restore it to a level of cleanliness and appearance that perhaps you haven’t seen in years. Your carpet is the first place you put your feet in the morning and maybe the last surface you feel when you go to bed at night. It’s a major part of your home’s décor as well as comfortable livability. And we know it’s not inexpensive. Carpets range greatly in price depending on a number of factors, but it always represents a big investment. You want to care for it accordingly, and that means finding the service you can trust to use the best equipment and cleaning techniques in the business. For us to be that company, that means always following our version of the Golden Rule: Treat every client’s carpet as we would our own. It begins with cleaning your carpet according to the type you have, the condition it’s in, and your needs in having it cleaned. For instance, while all of our services produce excellent results—which translates into cleaner air and a room or home that just feels better—we offer different cleaning packages to meet your specific needs. For starters, even our most basic “budget” carpet-cleaning system includes pre-inspection, pre-conditioning and spotting for stains (some stains will incur a small surcharge), followed by powerful truck-mounted steam extraction and deodorising services. This is a great choice for end of lease amp or bond cleaning, when the carpet can benefit from a thorough cleaning but your budget is limited. Our most popular carpet cleaning package is the next step up, an even more thorough cleaning service still offered at an affordable, competitive price. 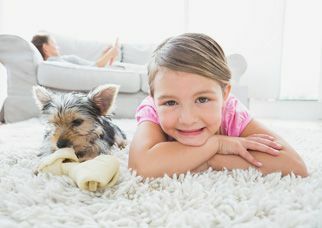 This eight-step regular carpet-cleaning system includes all of the above in the budget package as well as heavy duty pre-vacuuming with hospital-grade filtration to remove more than 70 percent of dry soil, furniture removal and replacement (including adding protective tabs), and a final step in which we go over the carpet to remove any cleaning marks. This includes resetting the carpet pile for a beautiful, like-new appearance and reducing drying time as well. Finally, we also a Premier service designed especially for soiled carpets or homes with pets. One of the biggest differences between the Premier package and our other carpet-cleaning services is the addition of rotary agitation with a soft brush or pad to loosen soiling. This makes it possible to erase even most long-standing stains during the cleaning process. We’re always available to discuss your needs and recommend which cleaning package would work best for your home. We would love to add you to our list of satisfied customers in the Brisbane/Northside area by exceeding your expectations. We look forward to hearing from you!